Much of this below is taken from Ninja Magazine in 1987 By Ilan Gattegno and updated a little. 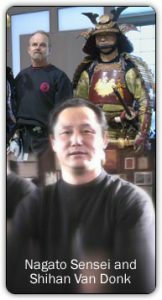 “He is like the shadow of Soke Hatsumi and many see him as the one who will eventually take the helm of Bujinkan” The Bio of Nagato-DaiShihan as published in Ninja Magazine in 1987 By Ilan Gattegno. He is a giant (in many ways), well muscled, the type of person you would hire as a bouncer if you owned a night club. His muscle makes you fear him, but when he’s moving, it seems that he does not use his strength at all. He moves so gently and smoothly that it becomes unclear whether he is fighting or dancing. DaiShihan Toshiro Nagato does not share the enthusiasm that others have about his rank. To them he occupies a lofty perch. but he still considers himself a beginner, still learning all the time. To him years of ninjutsu is nothing to write home about. The 52-year-old ninjutsu master teacher started his life as a martial artist When he was eight. Like most Japanese school children. he took part in the compulsory judo lessons that are as much a part of the educational system there as gym is to American children. The young Nagato enjoyed his judo training and his unusual size and strength helped him win third place in the Kodokan tournament for junior high school students. As far as Nagato was concerned, this was to be the end of his career as a judoka, but the Kodokan masters thought differently. They decided to send Toshiro to the U.S. to teach judo at the University of Ontario in Oregon. While teaching there he was also studying, all the while dreaming of something else. 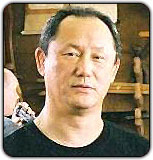 He had heard the name of the Judo master, Hatsumi Masaaki and, while in the states, had read Andrew Adams’ book Ninja. The Invisible Assassins. Nagato wanted to be a true martial artist, not just a judoka, and ninjutsu seemed the way to go. He decided then and there that when he returned to Japan, he would seek out this art. Things didn’t quite work out the way Nagato had planned as circumstances led him into the professional kickboxing ring. He began entering competitions in Tokyo to earn badly needed money. Where size had always been his ally, it now became his adversary. A giant at 90 kg (about 195 pounds), he was far heavier than any established division in Japan. He then undertook a strict diet that would eventually drop him to 72.5 kg- still the heaviest division for competition. In three major events in Korakuen Halls, he won all his fights – all by knock-out. These victories made him champion of the Shin Jin – the newcomers. Before he began to explore ninjutsu, Nagato felt that he had to get out of Japan. Having been in Oregon, he knew that there were places in the world that offered less stress than Japan. Kickboxing had been a way for Nagato to release some of that stress, but now that he was through with that sport, he felt he needed a change of atmosphere. A friend in America, Michael Echanis, a former Green Beret, invited him over and he accepted. Echanis, a professional soldier and Vietnam veteran, wanted to learn the martial arts from Nagato. Echanis said there was a job waiting for him at the Special Forces camp in North Carolina. Hatsumi immediately saw talent when Nagato came to him. He saw the man’s fighting spirit right away. There is no wonder in this, however, as street-fighting was common in the neighborhood that Nagato grew up in. His background in judo and kickboxing was a big asset as well. Nagato rose through the ranks like a rocket. He put a lot into his training and, before he knew it, he was a master teacher. Nagato teaches several times a week in his own dojo and at the hombu dojo. Nagato earns his living as a hone-tzugi (bone setter), just like Hatsumi, and lives happily in Saitiama ken with his wife Mamiko and two sons Yoshiki and Yuhe. Nagato does not foresee a big change in ninjutsu in the future. “We don’t consider ninjutsu to be the ultimate art,” says Nagato. “Budo, the martial arts world, is the essence of everything. It’s all still alive and we want to keep it alive. We look for understanding, for peaceful life and happiness. Budo is good for the country, and for the whole universe.